"Pure, beautiful and full of spirit. This was the essence of Albania", described through amazing photos of Albania taken by Michael Jurick one of the best known as New York City’s photographer. 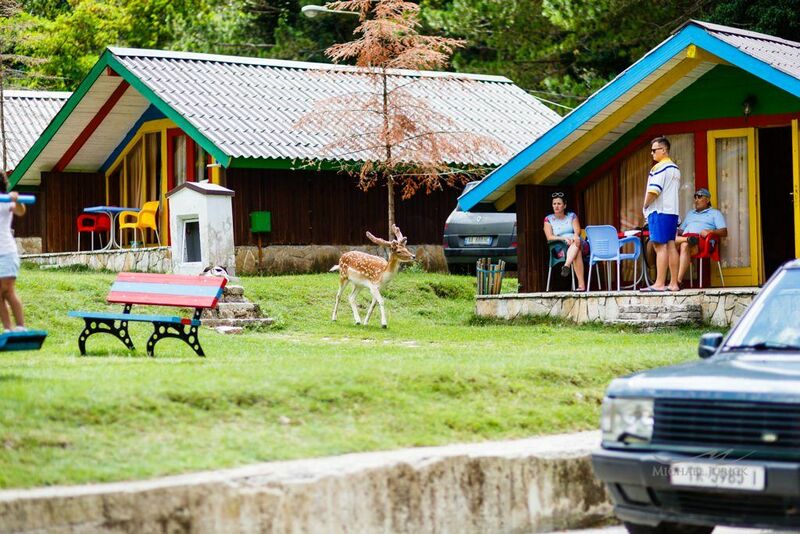 The article and photos was published in his website with the tittle: "Albania – Europe’s Hidden Jewel" (http://www.jurick.net/2015/08/abania-europes-undiscovered-jewel/ ). There are about 90 photos of #Albania, especially the seaside, southern riviera, as well as UNESCO cities of Berat and Gjirokaster. "When we told our friends and family that we were going to Albania for our summer vacation, they all asked the same question, “why Albania?” After you see these photographs and read this journal, all your questions will be answered. 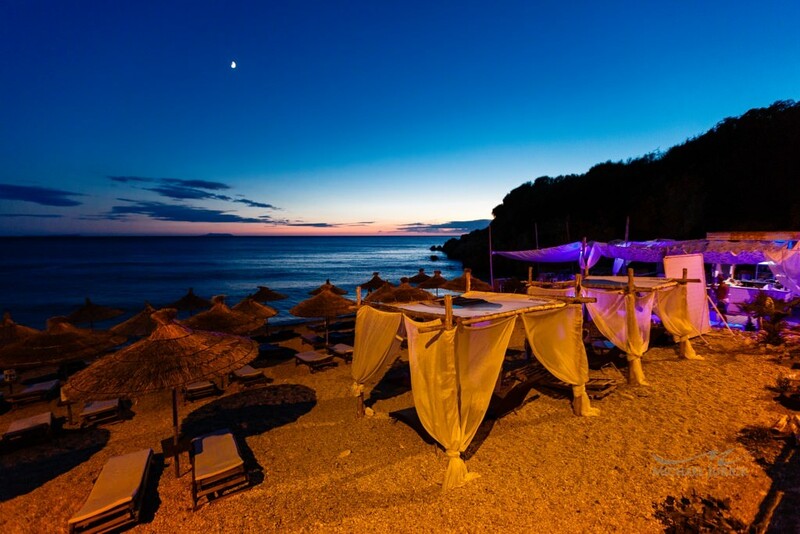 We found Albania to be a gorgeous jewel of Eastern Europe’s southern riviera. The lead photograph from our journey is of our daughter Eden. We stopped for chocolate and vanilla ice cream macchiatos at the edge of a cliff-side mountain cafe. Fashionista Eden soaks up sunshine between billowing drapes that reveal a jaw-dropping deep azure sky thousands of feet above straw-colored beach umbrellas. To me, this was the essence of Albania. Pure, beautiful and full of spirit. After establishing its independence from dictator rule in 1991, the country has now spread her wings to shre the world the hidden gems within. The Albanian riviera was a fabulous highlight of our trip. The views from our drive along the rugged coast south from Vlora to Llogora to Himara were staggering! Most of Albania’s roads are steep, swirly switchbacks – but all reveal magnificent vistas at each hairpin turn. Soaring green mountains drop straight into the Ionian Sea thousands of feet below. 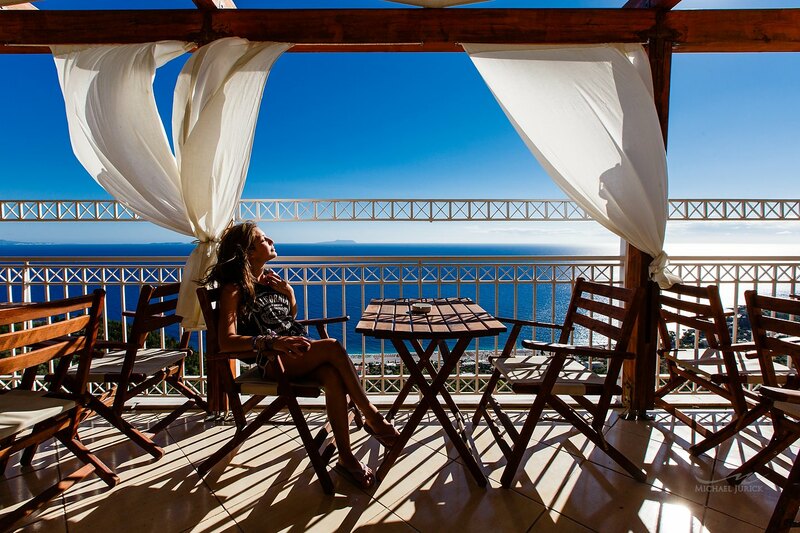 Once we arrived in Himara, the charm of the Albanian riviera had completely taken over. The weather was absolutely pristine with just a hint of soft wispy breezes and 81 degree temps. The crescent cove of the coast anchored both the charming village below and homes that dotted the hillside rising into the mountains. The sun bathed it all in gold. The drive from Himara to Sarandë featured another awe-inspiring set of breathtaking views of the southern Albanian riviera. Homes peppered the rocky edges and donkeys shared the winding roads. We stopped for lunch and cappucinos at the gorgeous panoramic cafe, Perla and ate fish soup and fresh salads. When we pulled into Sarande, the sun glittered on the colored hotels lining the crescent cove directly across the Greek Island of Corfu. The penultimate stop on our Albanian adventure took us to the southern tip of the country to a town called Ksmali which featured small islands lining the channel to Greece’s Corfu island. Small rustic fishing boats anchor off the beach. There was color everywhere. We jet-skied, we ate fresh fruit, we enjoyed life. The vibe in the air here in Ksamili was perfect pristine paradise. On our drive to Berat, we witnessed the most unusual and peculiar thing that ended up being the topic of conversation the entire trip. We saw hundreds of half-completed homes in nearly mint condition. We later learned from the people of Albania that after gaining their independence in 1991, Albanians began to build a home to secure property rights. Those homes are built in phases and until each phase has the funds, it remains incomplete. See the pink house in the photograph below to see what I’m talking about. You will also see how we shared the roads with all types of livestock. 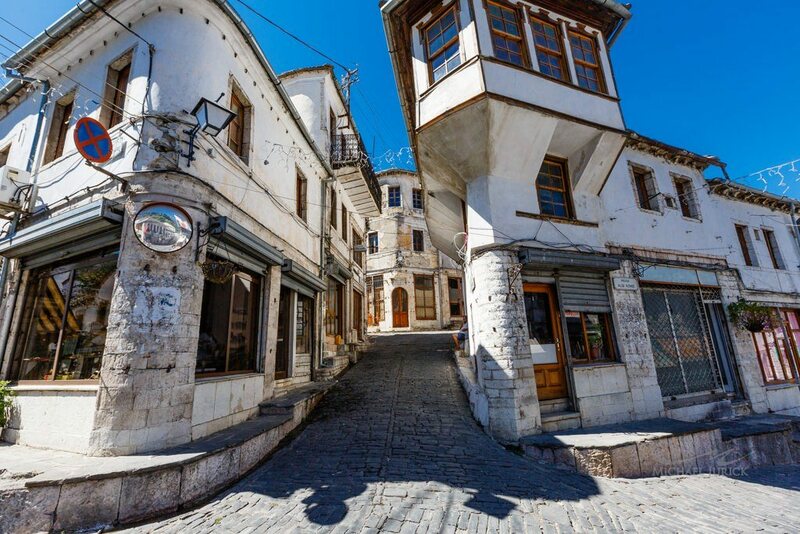 When we arrived in Berat, we were smitten with it’s ancient charm. We explored the Citadel castle in Berat and walked, talked, and laughed until sunset. At sunset, we came to the peak of the castle mount and glanced across the Osumi River tothe Gorica neighborhood, whose houses face those of Mangalemi. 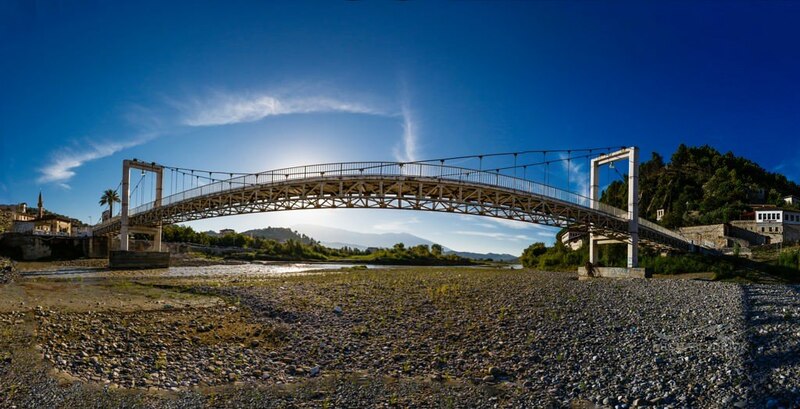 The arched bridge of Gorica, built in 1780, is a beautiful architectural monument constructed to link Gorica with Mangelemi. We then walked along the promenade for a stroll to enjoy summer life among this quaint Albanian town. The view of the white houses climbing up the hillside to the citadel is one of the best known in Albania and features homes with windows that seem to stand above each other. This city is the pride of Albanian architecture, and under the protection of UNESCO .I took many different photographs in this city – it was visually striking! What we found so unique about Albania was it’s deep family roots. Everywhere we went, we experienced family-run businesses. Hotels, inns, restaurants, businesses, shop-keepers, and farmers all had multi-generational family members involved in some part of the business. Everything was organic. 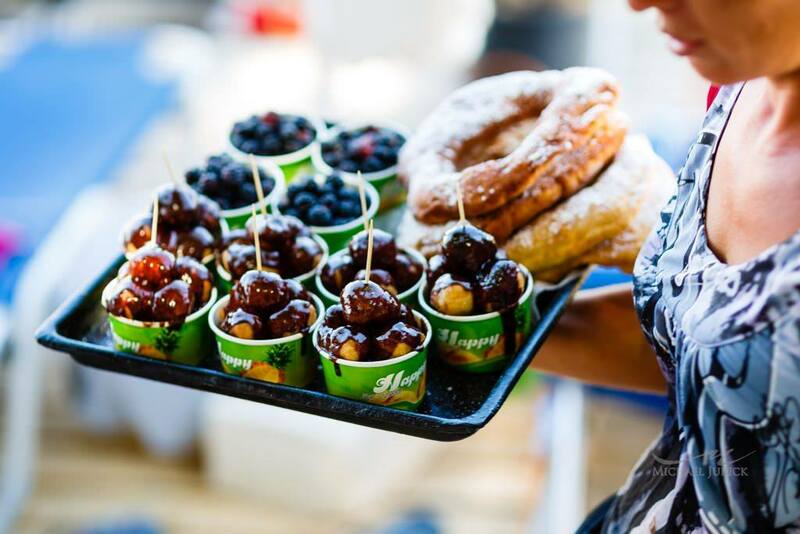 With farms everywhere you looked, and fresh seafood at arms length from most restaurants, the food was fresher than you could imagine. On our drive back north, we stopped in Gjirokastër an ancient hilltop village rich in history. 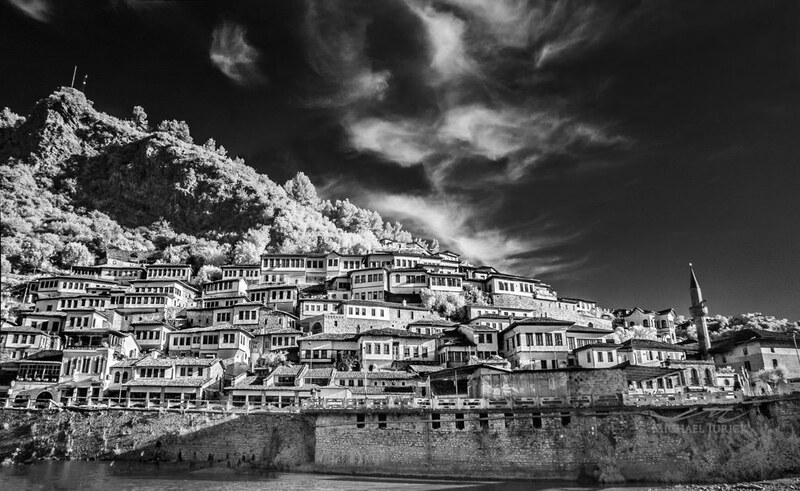 If you like these photographs, do your self a favor and book a trip to Albania!